This one is for all the kiddos out there!!! (And the kiddos-at-heart!) I made this pumpkin a few days ago for my son’s school Fall Festival. I wanted to do something very kid-friendly and something they would recognize. This pumpkin was a bit rushed though - I only had about 3 hours to carve and paint it, AND the walls were VERY thin in this pumpkin – so I couldn’t carve it nearly as deep as I would have liked. The eyes were literally hanging on by shreds, which is why the eyes are a bit lumpy – they were just falling apart every time I stuck my paring knife in to carve them. But no biggie – it was all for kids, and they definitely got a kick out of it (and so did the adults)! 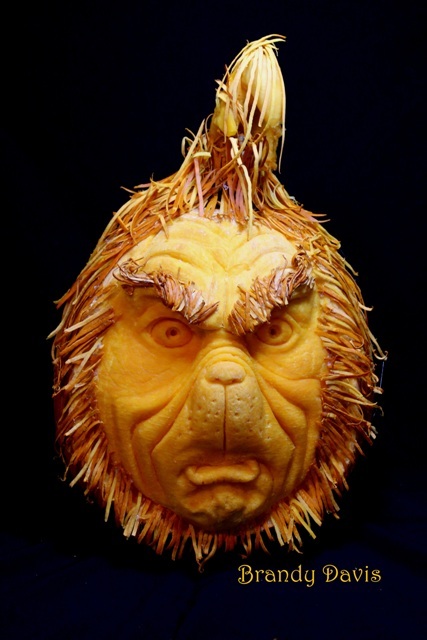 This is my kid’s favorite pumpkin to date, for obvious reasons – literally! – It has been they only character I’ve carved that they could recognize and identify with. Haha. 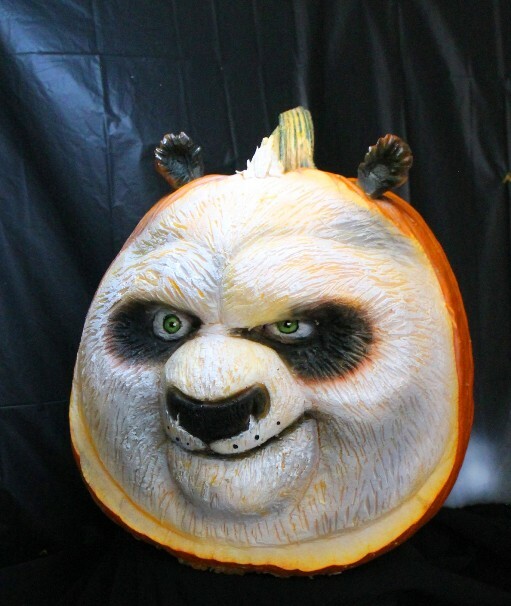 But they, like many kids, are huge Kung Fu Panda fans – so I just KNEW this had to be my next pumpkin! And although it is currently sitting out on our front porch drying out and looking pretty worse for the wear, they still have the biggest smile on their faces every time they walk by to see him – and that is where my sheer joy of doing this kicks in. And if anyone is wondering, the “dumplings” are just small white Casper pumpkins that I cut the stems off of and put on a plate. Then I painted some wooden chopsticks red and added them in for effect. (And I’m obviously on a bit of an airbrushing kick right now, so yeah, I painted him. Not my best paint job, but maybe one day I’ll revisit this pumpkin when I have more time! ) 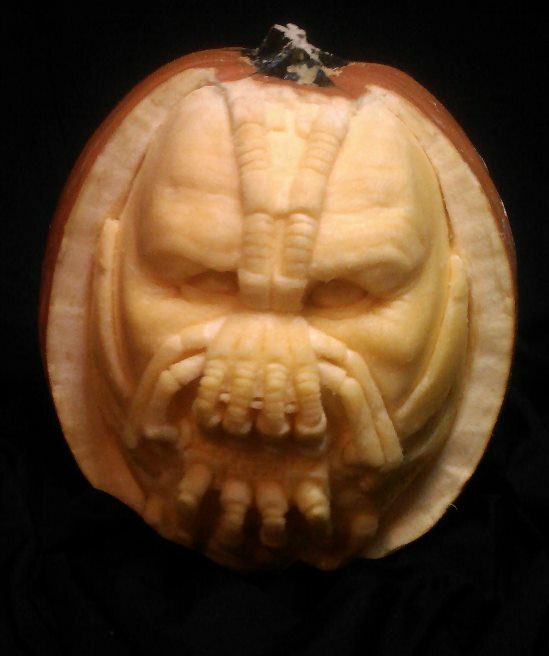 It’s only my second pumpkin I’ve ever painted/airbrushed, or my second “anything” I’ve airbrushed in over 10 years. 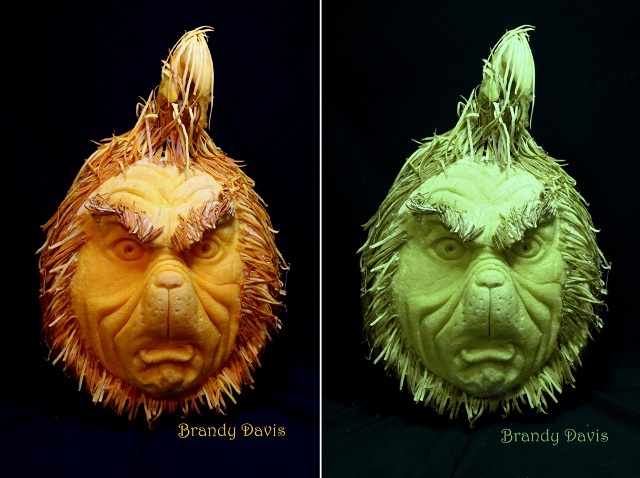 Expect to see a few more of these painted pumpkins in the near future…. And I can’t forget the best part!! Below is the time-lapse video I made. Like I said, I’ve gotten into a habit of recording all of my pumpkins that I make because I just LOVE making these time-lapse videos. They’re not professional quality or anything – I do them myself. And just to be clear, I don’t get paid for making them or having them on YouTube – they’re all purely for entertainment purposes. All a labor of love. So feel free to grab your kiddos and sit them down and watch this with them. I like to see if they recognize who it is before he’s all done! Happy Halloween! Speaking of that, this was my first time airbrushing anything in over 10 years – I mean, the box I kept my airbrush in was literally covered in dust. haha. I almost sold it a few years back because I never used it. Glad I kept it around though. And I have NEVER done anything like this. All I ever did was paint a few simple murals for a local business, never faces or sculpture painting or anything – so it was all new territory for me. VERY fun though! 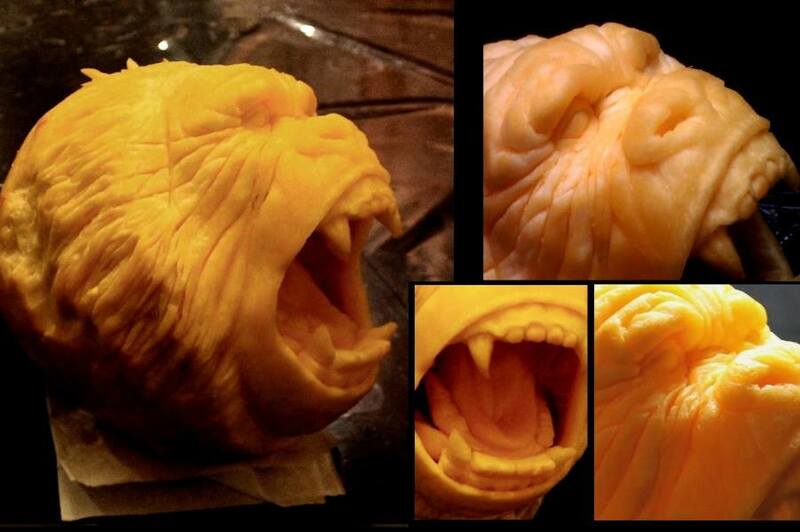 I might have to take up airbrushing sculptures as a new side-hobby! I’ve also gotten into the habit of recording every pumpkin I carve lately – I think I’m getting addicted to making time-lapse videos for these things. I absolutely love it. I think getting to choose the music is my favorite part! 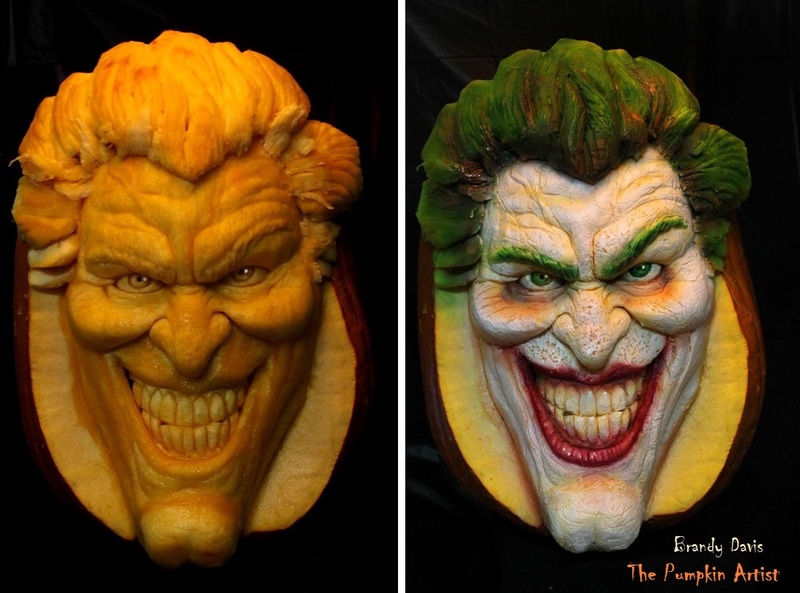 Here is my Joker 3D Pumpkin time lapse video below. Feel free to share with your family and friends! 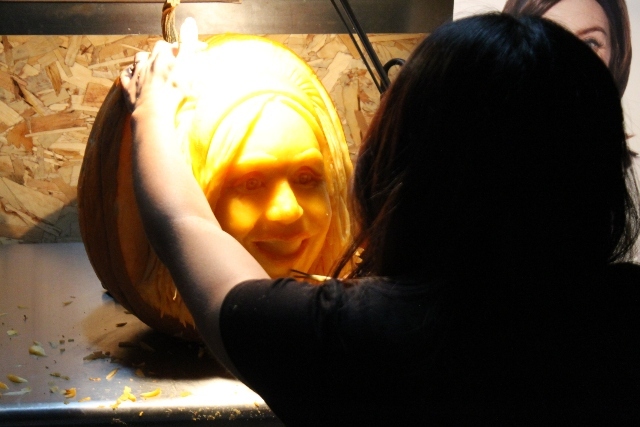 (Or strangers…3D pumpkin carving knows no bounds. Not sure I’m going to top this pumpkin this year, but we’ll see! Happy Halloween!!! Hope You Like Nursery Rhymes! I’m On A Pumpkin-Roll This Year! – Here’s ANOTHER Time Lapse Video! I’m on a”Pumpkin-Roll” – Haha! Get it? !…I’m on a roll, but there are also pumpkin-rolls! Hahahaha!………………[silence]…………………No?….it’s just me then…..ok…..::ahem::…..well this is awkward……. Ok, crappy joke of the day aside, let’s get down to the fun part! 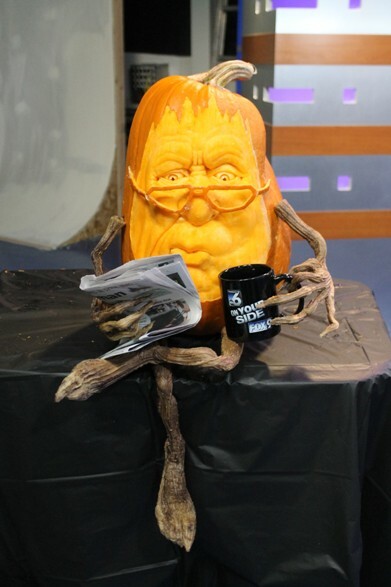 For the past 3 years Good morning Idaho has asked me to come in on Halloween morning and carve a pumpkin live during their 3 hour show, which I did love doing. #Repost @m_festrada with @repostapp ・・・ #PumpkinWeek day 3! 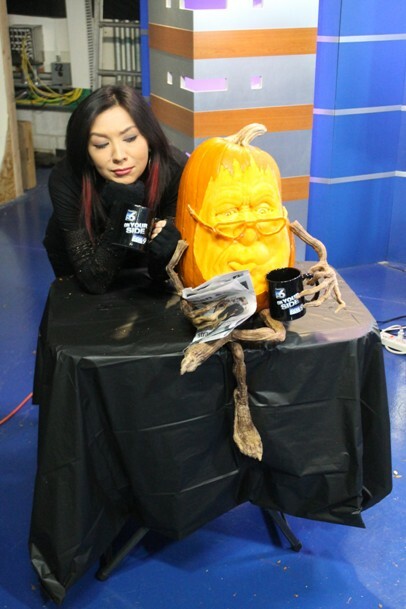 Pumpkin carving with @the_pumpkin_artist through 8 a.m. on Good Morning Idaho! And it doesn’t really seem all that difficult, does it? 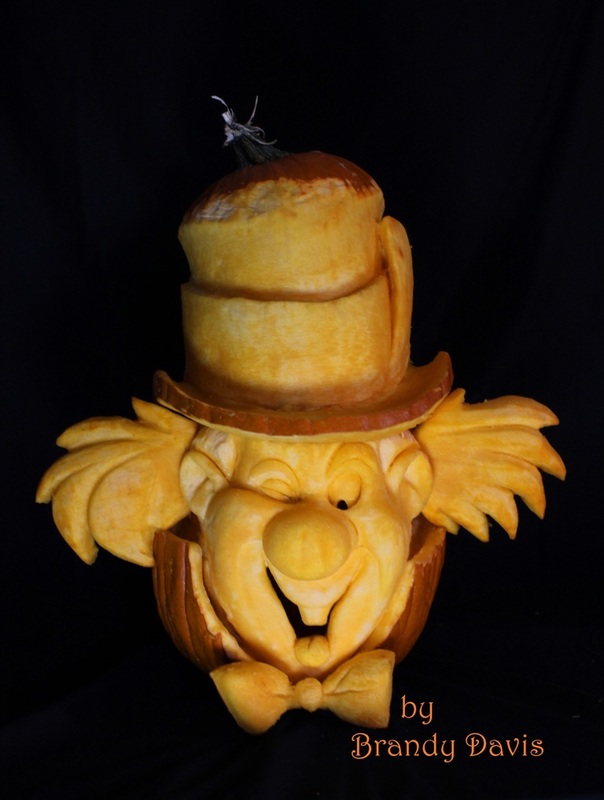 Show up and carve, and answer a few questions in between time….until you find out that their show runs from 5:00am-8:00am. YIKES! Good morning, indeed, Idaho…..but I guess that’s what you get with a state full of farmers that have to get up before the sun does. (Hey, they grow my pumpkins, so I’m not complaining! ) And not to mention, I have to leave at 3:30 in the morning so I can get to their station to set up at 4:00am and start promptly carving by 5:00am. Like I’ve said before, it’s a labor of love. And generally when I go on their show, I’ll also have a finished carving to take with me to display while I carve the other one. - It only took me about 3 hours to do, BUT, did I mention that I didn’t start it until 11:00 at night (I had to carve other pumpkins for other events earlier in the day), and I finished it at about 2 in the morning, went to bed, and then had to be up at 3:30am? Haha. Yeah, not sure if that’s called “ambition” or just sheer “craziness”…..probably a bit of both. And thankfully I still had half-a-mind intact to think it would be a good idea to record this carving. I didn’t intend on making a time lapse video with it, but I did anyway because I just love making them. I didn’t have time to post it last year before Halloween was over, so I saved it for this year. 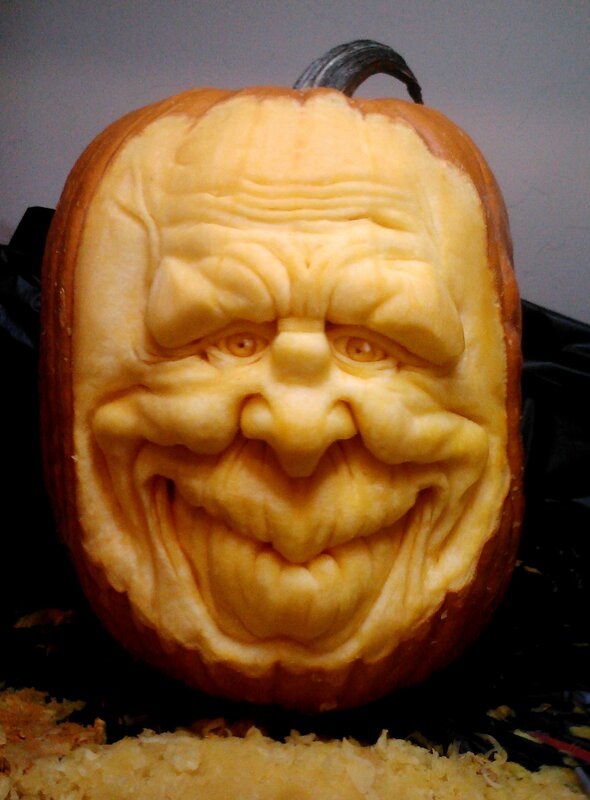 So, having said that – Happy Halloween! 2016! 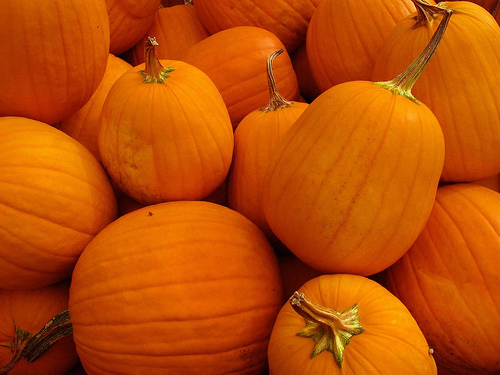 So it has been a long year, and pumpkin season is upon us yet again! 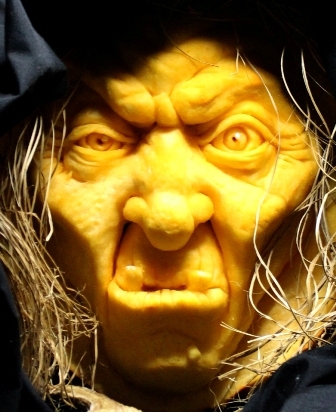 I even called my favorite pumpkin patch every week throughout September to see if their pumpkins were ready….I think they were getting tired of the crazy pumpkin lady calling all the time. Oh well! 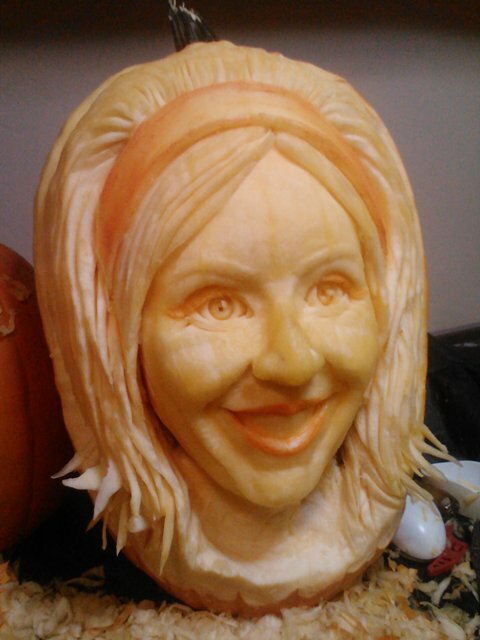 A girl’s gotta carve! Now when it comes to pumpkins, I don’t discriminate; Grocery store pumpkins, pumpkin-patch pumpkins, or the mysterious-pumpkins-that-spontaneously-started-growing-in-your-mother-in-law’s-front-yard (thanks Karen! ) – if they’re decent quality for 3D carving, I’ll carve em’! Anyway, I grabbed a shopping cart (grocery store, remember!) and picked up about 8 of them….yep, stuffed em’ all in, and took them inside to pay for them. Oh yes, and people were staring, most likely wondering who the heck this crazy lady was with a huge goofy grin on her face and a shopping cart overflowing with pumpkins in September. But who cares! – I left a very happy camper. Yep, if you haven’t guessed it yet, that is Oswald Cobblepot, A.K.A. “The Penguin” from Batman. 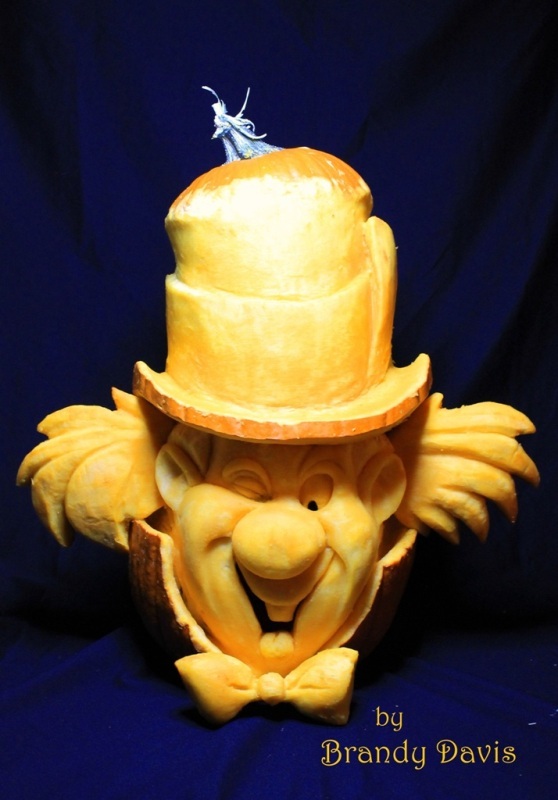 Everything you see is made from pumpkin – including his hat, cigarette holder, and monocle. It took me about 8-9 hours for this one. It’s based off of a sculpture I saw online somewhere, but there wasn’t an artist listed. So if you recognize it, please let me know the artist of the original sculpture so I can give him or her a shout out! And it’s never easy carving pumpkins while juggling cameras to make a time-lapse video, but I usually always try to film them when I carve. I really love putting together the videos right after. 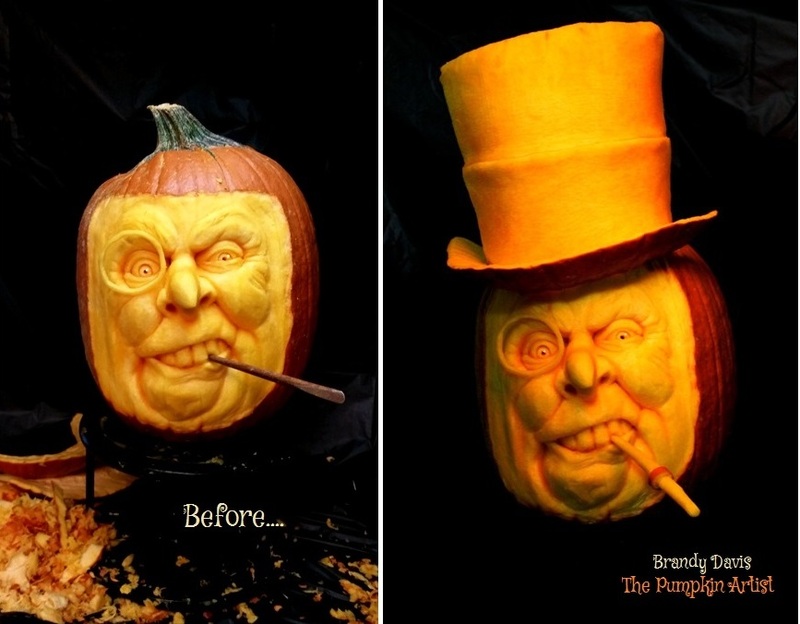 Speaking of that, here is the time-lapse video of this pumpkin being made. (Although, you’ll have to forgive me – I usually try to put as much of the carving process from beginning to end on my time-lapse videos, but this one was cut a bit short. About 3/4 of the way through carving, my camera ran out of space. So yeah….life happens. But I think it still came out ok) Check it out below, and feel free to share it! So this is only the start of my season. Who knows where it’s going to go from here….but one thing’s for sure…the ball is rolling……or rather, the pumpkin is rolling….. Yes, oh YES! It’s that time of year again! Pumpkins, pumpkins, pumpkins!!! Needless to say, it is going to be an incredibly busy season for me. I am totally excited and getting everything ready that I can. 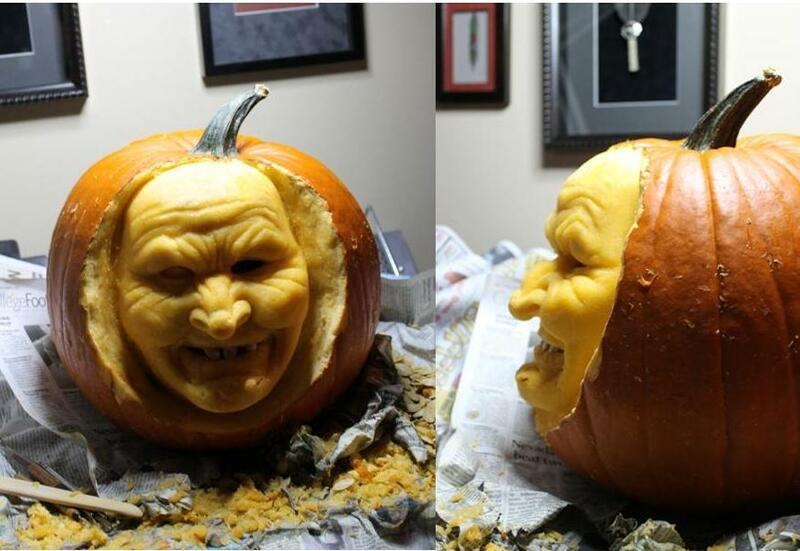 For those of you who are also pumpkin-carving enthusiasts, you are probably doing the same. 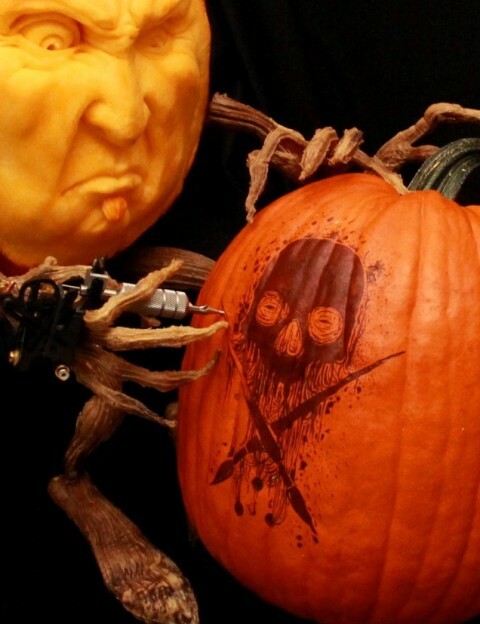 And for those of you who are new to the world of 3D pumpkin carving, this would be a great time to start purchasing tools if you haven’t done so already. Even though I have a decent-sized pumpkin carving tool inventory, I definitely want to make sure I have back-ups. You never know when tools are going to finally give out and break. 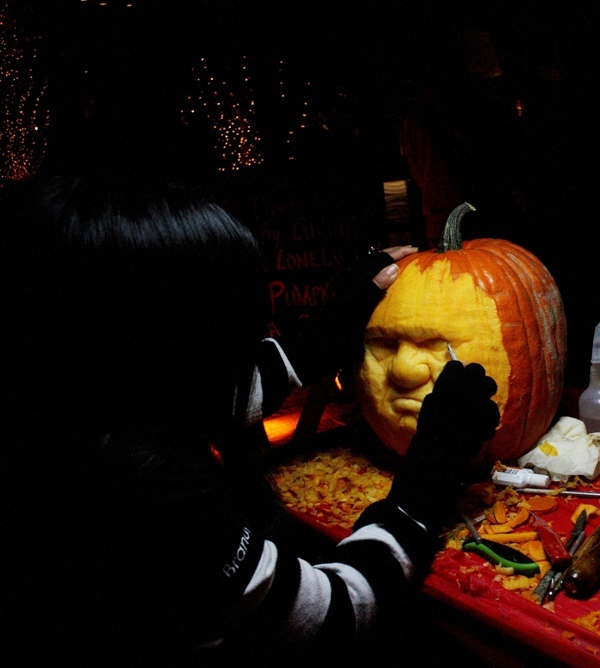 During a pumpkin carving event I can’t afford to to loose an important carving tool in the middle of the process. Heck, even when I’ve only carved 3-5 pumpkins for the season I’ve had tools randomly break or come apart. So it is always a good idea to have back-ups. Now, if you are just a 3D pumpkin carving beginner, click here to see a basic list of my recommended 3D pumpkin carving tools. Some of the tools on this list are a repeat of my last list, but a lot of the tools are new items I have added to my tool box this year to make carving go even more smoothly, and to make displays even more fun! These are the tools I use for sculpting very fine details in each pumpkin. They are Kemper brand, and they are about 5 inches long and are excellent tools that will last a very long time if you treat them well. A MUST have if you will be doing fine detail work. Although you will not use everything in this kit, you do end up using a majority of it. And this is a GREAT kit for all skill levels. The large loop tool is used for scraping off outer pumpkin skin as well as blocking in large shapes. The double-ended ribbon tool is used for a majority of the sculpting. The needle tool is used for scraping out fine detail. The wooden modeling tool is used for smoothing out lines and fine detail. And the yellow sponge allows you to take a bit of water and wipe off stray “pumpkin bits” off the pumpkin’s shell and off of the carved area after you’re all done. Please note that there is a cheaper version of this clay-sculpting kit (NOT Kemper brand, I believe it is Stalwart brand) that I mention in my previous 3D pumpkin carving tool post, but again, I cannot attest to the quality, however it contains all of the same items and did get good reviews. Click here to check it out. I have mentioned before that a traditional vegetable peeler just doesn’t cut it for me (no pun intended) when it comes to peeling the rind off of a pumpkin, especially a tough rind. This, however, seems to get the job done. 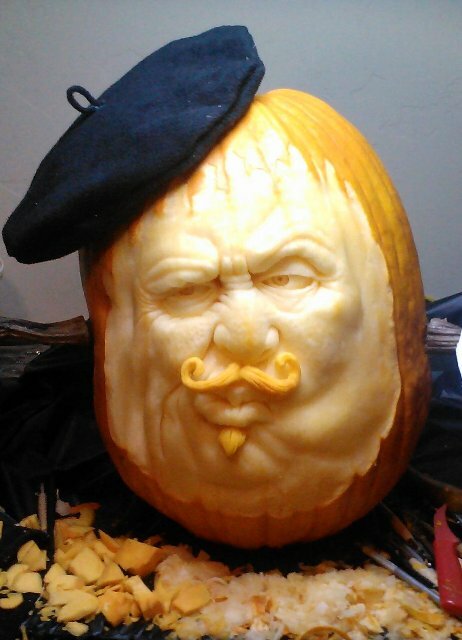 Usually 3D pumpkin carvers will take a large pottery/sculpting loop tool and scrape off the outer pumpkin rind before they start to carve. However, I personally don’t like the stress it puts on the loop tool – if you’ve ever done this, then you know how tough pumpkin skin can be! I’ve broken a few loop tools because of it. This heavy-duty julienne peeler really helps ease the process and seems to be the only other thing I have found (besides a Ped Egg) that will peel through tough pumpkin skin. 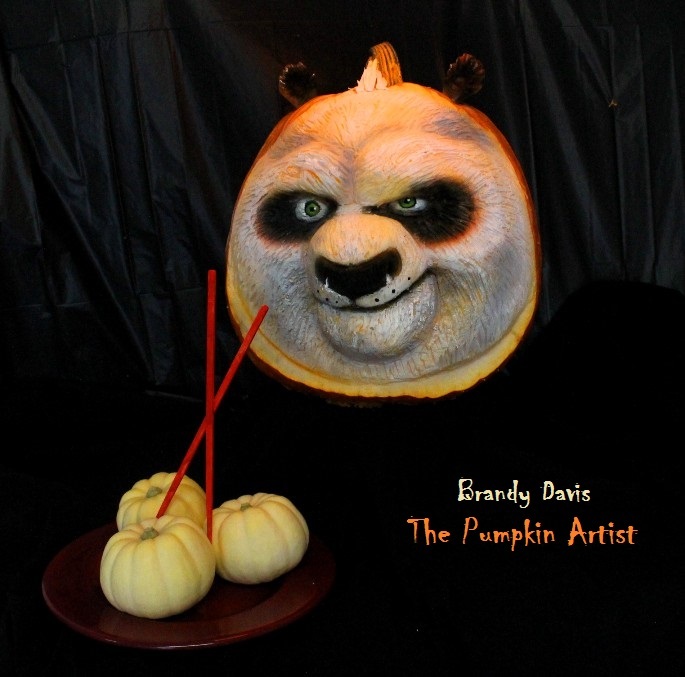 There are some things I can’t live without when it comes to 3D pumpkin sculpting, and THIS is one of them. If you have any desire whatsoever to create clean, detailed cuts, lines, and the like, then you NEED a birds beak paring knife. I don’t even care if you get this one, just, PLEASE , for the love of carving, get yourself a birds beak knife! I didn’t use this knife for the first 2 years I did 3D pumpkin sculpting, and quite frankly, I’m sad I didn’t use this sooner. It does take some getting used to, but once you do, you’ll never look back – It will totally refine your work. I don’t really NEED 2 of them…but I have 2 of them…. 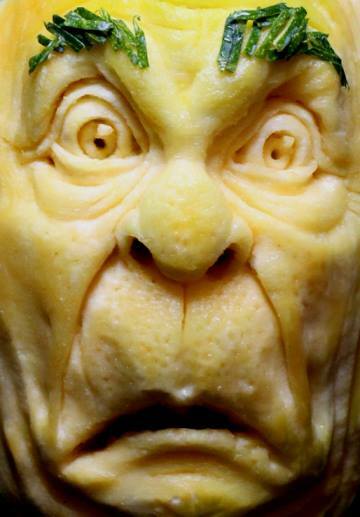 I just found out last year that Super Glue is the only glue that will bond wet pumpkin flesh to wet pumpkin flesh. You never know when an accidental slip of a carving tool will happen and end up chopping off the tip of the nose of your sculpture (Been there, done that!). 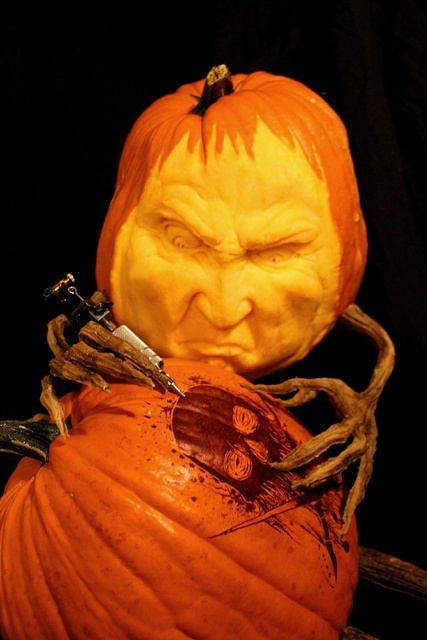 This is a MUST have for any tool kit of a 3D pumpkin carver! 6. A Brow Brush……..wait, what?….. Yes, you heard correctly – A brow brush. As in, a brush for your eyebrows. 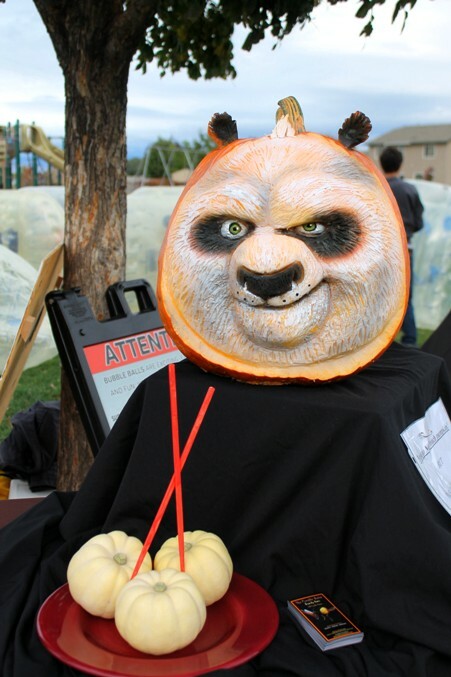 However, that’s not what this little guy is used for when it comes to pumpkin carving. This is an amazing tool to keep for detailed clean-up in harder to reach areas, such as deep folds and wrinkles or between strands of carved hair (and yes, I’m still talking about pumpkins, not people. ) You’ll find that when carving, a lot of little stray pumpkin bits get lodged in weird, hard to reach areas on the pumpkin, and this little brush is soft enough to wipe out unwanted pumpkin spatter without damaging your work. (P.S. I suppose you could use a pipe-cleaner for this same purpose, but I like the fact it’s durable and that I can just wash this out and reuse it. You know, there’s something about giving a pumpkin arms and legs that really just make it come to life! I already own a set of these pumpkin vine arms and legs (made by Villafane Studios), but they worked so amazingly last year that I decided I just HAD to have another pair this year! Ohhh, the endless possibilities!!! 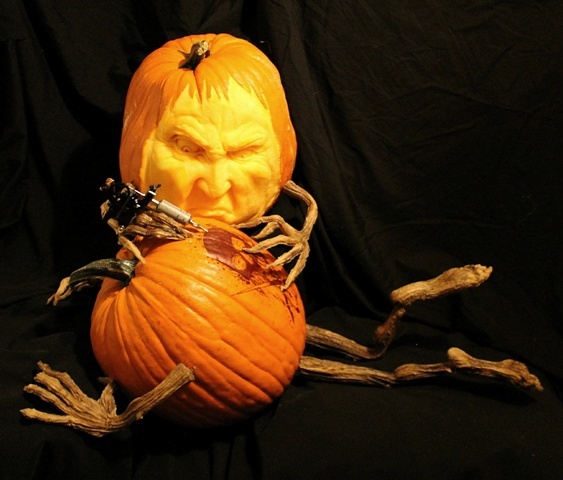 I would like to add that you can also get the pumpkin vine arms, legs, and stem off of Villafane Studios website. Either way, supplies are limited, so order soon if you to make sure you get a set. 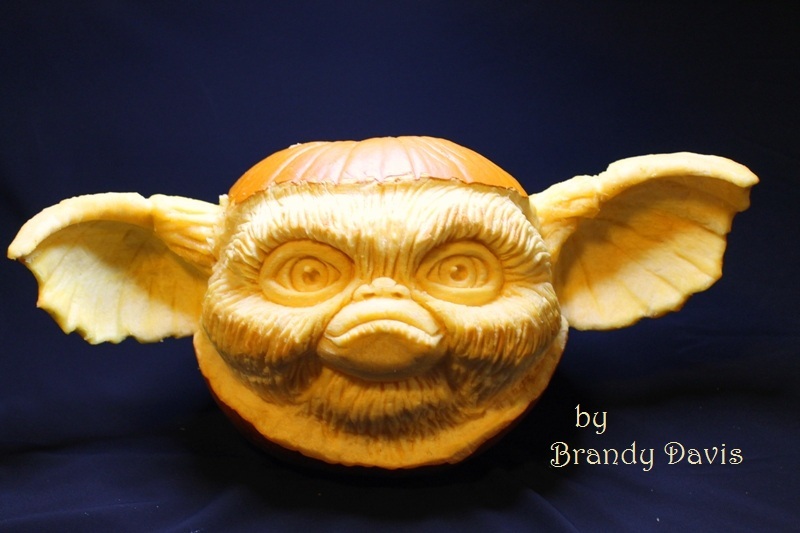 You will DEFINITELY have the coolest pumpkin on the block! 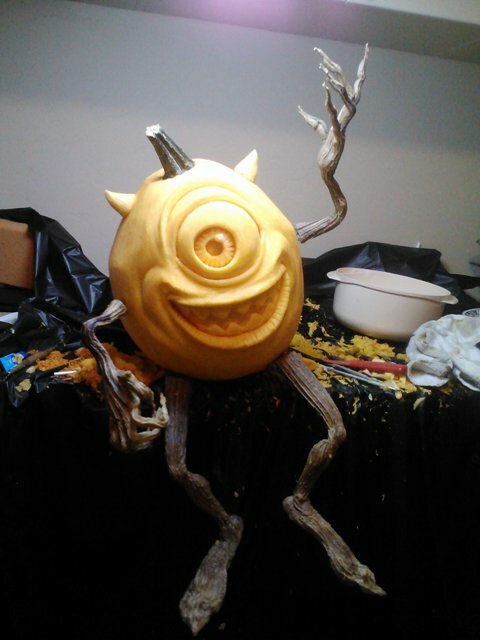 “Mike Wazowski” 3D pumpkin carving by Brandy Davis. Yeah! The kids got a kick out of that one last year! So as of now, that is my list. And I stress the, “as of now” part….I’m sure I’ll think of more tools to order in the coming days! And when I do, I’ll be sure to let you all know! If you have any questions or suggestions, please feel free to leave them in the comment section below! I’ll be happy to answer anything I can. Stay tuned for more recommendations as well as my exciting new pumpkin carving ventures this fall!!! It’s a Poll! I Want to Hear From You! Go ahead! Cast your vote! 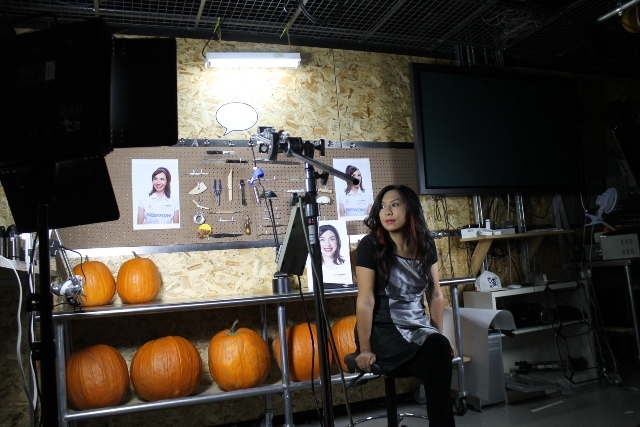 Would you like to see a "3D Pumpkin Tutorial ONLY" option added as a reward for $10 on our Kickstarter page? That's so worth it! I would definitely get it for $10! That price seems a bit too high...I'd get it if it was $5. I'd rather have the tutorial AND the book. 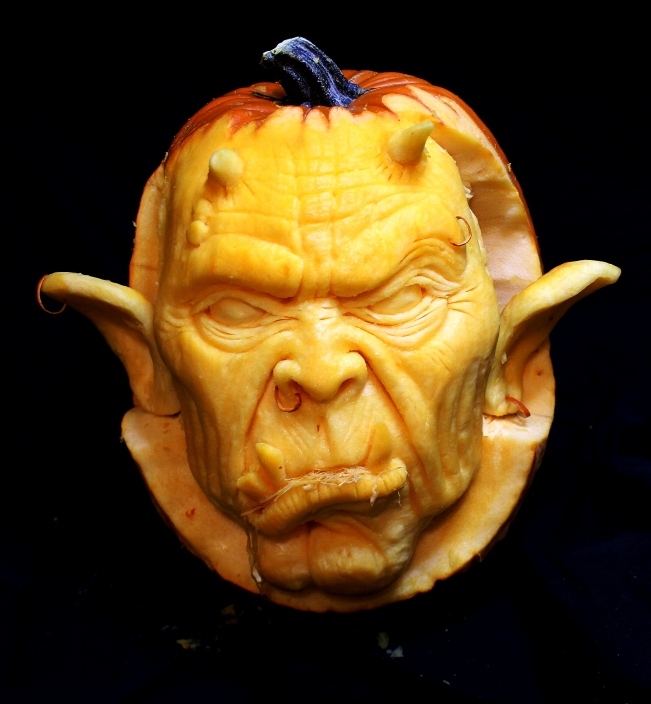 I'm not interested in a 3D pumpkin carving tutorial. If enough people are interested in the option or a tutorial only, then I just may add it in! I want to make sure I’m giving you guys what you want! 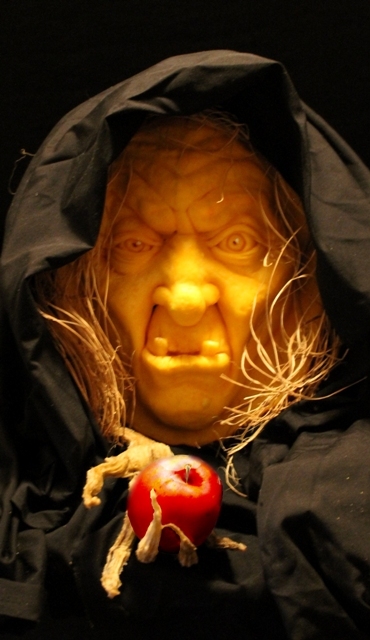 And in case anyone is wondering, the tutorials will be received before October 31st of this year – giving you plenty of time to carve to have a pumpkin ready for Halloween! If you have another suggestion for a reward you would like to see added to our Kickstarter page, please leave it in the comment section! Thank you for your input!!! We Surpassed Our First $1000 Milestone! Thanks so much to those who have donated so far!! And I’ve noticed that a some people are saying they’ll buy a book AFTER we print/publish these books, but we need you all to know that we CANNOT publish/print these books unless we get fully FUNDED through our Kickstarter page! So it’s VERY important that if you want to help us reach our goal, you need to pre-order the books through our Kickstarter page RIGHT NOW! That money will be used to fund the printing of these books, which means you’ll wind up with a unique book you and your family can cherish for years to come! Remember, any amount helps! So go to our page, and click on the rewards you’d like, and donate! Thanks!!! IT’S TIME !!! 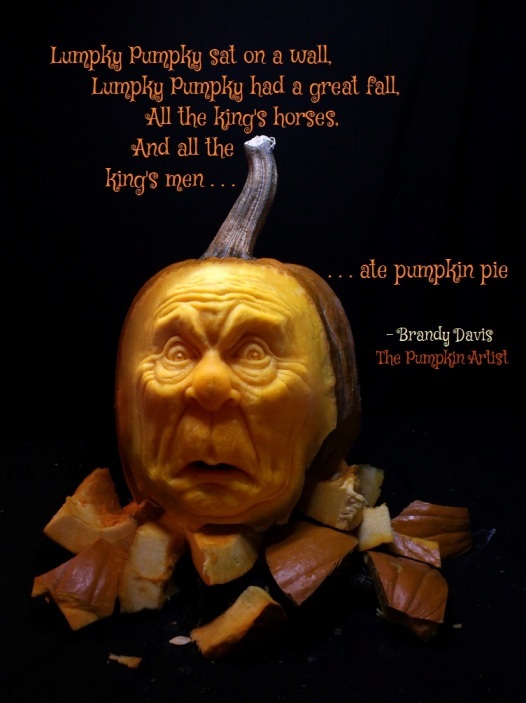 ANNOUNCING: The Peculiar Book of Pumpkin Poetry!! Alright family and friends!!! It’s time!!!! Officially announcing the “Kick off” of our very special project that Britt Scott and I have been working on ALL YEAR LONG!!! 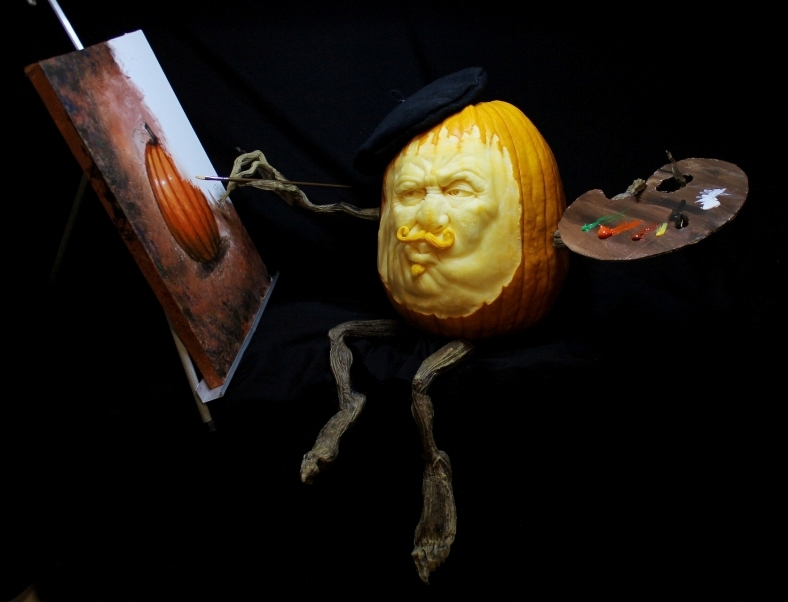 …….Introducing, The Peculiar Book of Pumpkin Poetry! A book perfect for ALL ages! – Young, and young at heart!!! We’ve put our heart and soul (and a lot of sleepless nights into this project! )…..We are on the very last step of our journey bringing this book to fruition, and we need YOUR HELP to do it! We’ve started a Kickstarter page where you can DONATE and PRE-ORDER the book (along with awesome limited edition prints and posters from the book, my first OFFICIAL 3D pumpkin carving tutorial, and MORE). Each donation gets us one step closer to funding the printing of the book! Also check out our Kickstarter page to learn more about all the behind the scenes work that went into our project!